The Peyto Hut is the first hut on the Wapta Traverse which is a classic Canadian ski traverse located in the heart of the Rockies just outside Lake Louise Alberta. There are four huts along the way to make the journey more enjoyable — the Peyto Hut, the Bow Hut, the Balfour Hut and the Scott Duncan Hut. Backcountry skiing and ski mountaineering objectives around Peyto Hut are glacier based so you need good white out navigation skills and crevasse rescue skills. 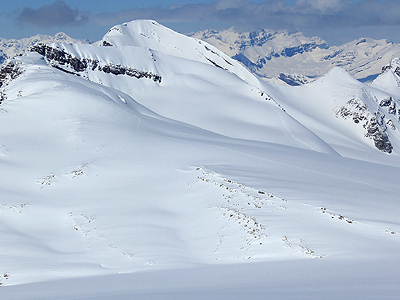 Within a short ski tour you can access Peyto Peak, Trapper Peak, Mt. Baker, Mt. Rhondda and of course Mt. Thompson. From Peyto Hut Mt. Rhondda is a fairly easy objective with a total distance of about 5km one way. The ski tour is fairly flat and safe (minimal exposure to crevasses mid season) across the Wapta Icefield, the routes leaves Peyto hut at 8,200ft and quickly climbs southwest about 500ft with Mt Thompson on your left (East) and Mt. Rhondda on your right (West). Continue southwest until you reach the shoulder of Mt. Rhondda and start climbing to the summit of the South peak. If you are ambitious you can climb to the summit of Mt. Rhondda further along the ridge line and access steeper descents. ACCESS: From Peyto Hut on the Wapta Traverse.